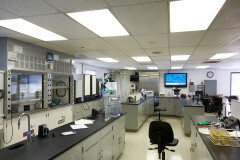 The District operates a state-of-the-art analytical laboratory that is fully accredited by the State of California’s Environmental Laboratory Accreditation Program (ELAP). The laboratory has two key functions: process control and compliance assessment. Samples are collected every day from various locations within the plant and a wide variety of tests are performed in the laboratory. Physical parameters such as oxygen content, temperature and solids concentration are measured and bacteriological tests are performed. The lab data and results are used by treatment plant operators to optimize both the biological and physical treatment processes to achieve the very highest effluent water quality. Laboratory staff also performs a series of daily and weekly analyses required by the District’s NPDES discharge permit. Results from this testing are reported electronically to the Regional Water Quality Control Board and are the basis for determining compliance with permit limitations. The District laboratory also provides contract analytical services to Cate School, a local college preparatory boarding school. Cate recently constructed a high tech water recycling facility and the District conducts daily bacteriological analyses allowing them to reuse 100% of the highly treated effluent from their facility to irrigate sports fields and other turf grass and landscaping on campus.